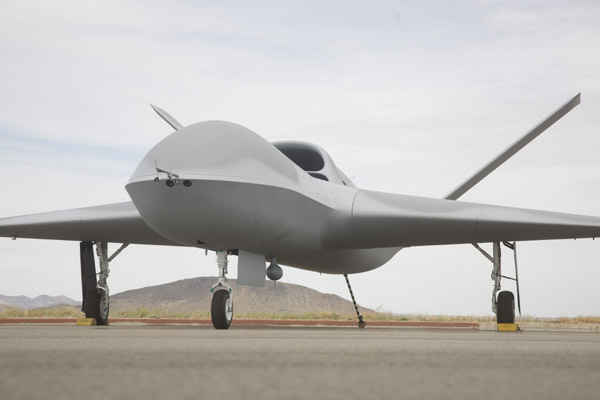 Pic General Atomics Aeronautical Systems Inc (GA-ASI), maker of the famous Predator and Reaper unmanned warplanes, has taken the wraps off a new and still more powerful kill-robot - the "Avenger". The company says that first flights have been conducted successfully this month. Avenger. Well, it wasn't going to be called Serenity or something, was it? For a full hi-res, click here. The Avenger, also known as Predator-C, has been developed with GA-ASI's own money, as was the successful Reaper (Predator-B) before it. GA-ASI's philosophy is to build what the company thinks the US military will actually need for operations, rather than trying to build what the services say they want. This philosophy has stood GA-ASI in good stead during the last ten years: the firm has managed to place a big force of unmanned warplanes with the US Air Force, which left to itself would probably not have bothered. The original Predator is now turning into an almost hands-off Army aircraft, the Sky Warrior, set to operate without benefit of expensive pilots trained in manned aircraft: the enlarged, turboprop-powered Predator-B (known as Reaper in the USAF) carries a lot more weapons and flies much higher. Now comes the Avenger, upgraded to jet propulsion and offering some Stealth features. GA-ASI say that it is "more survivable in higher threat environments" and say that it "will have higher operational and transit speeds than current Predator-series aircraft, resulting in fast response and rapid repositioning". The firm promises 400-knot airspeeds and a 60,000-foot ceiling using the Pratt & Whitney PW545B turbofan (the same used in the Cessna Citation XLS biz jet). The Avenger can be flown using the same control stations as its predecessors, and "can carry the same mix of weapons as Predator B" - that is, laser-guided Hellfire missiles or Paveway/JDAM smartbombs. It will also be suitable for carrying any of the various advanced sensors - ground-sweeping radars, thermal imagers, multiplex Argus spyeyes, mobile-phone sniffers etc. - nowadays so popular for airborne surveillance. It's a biggish brute, 41 feet long and with a 66-foot wingspan - comparable in size to an F-15 fighter plane, but wide rather than long. As can be seen in the pic above, supplied to the Reg by GA-ASI, the Avenger has an arrester hook; it might one day operate from aircraft carriers as well as runways. Avenger should be harder to see on radar or infrared-search-and-track than its predecessors, with the engine hidden between V tailfins (plus no propellor) and its weapons carried internally. However, it isn't a full-blown Stealth design, as a look at the undercarriage doors alone will confirm. The better "survivability" spoken of by GA-ASI probably refers as much to the improved ceiling (60,000 feet is too high for some anti-aircraft missiles the US forces might encounter someday) as to radar cross-section. Under the new Obama Pentagon roadmap lately announced by Defence Secretary Gates, the unmanned-warplane fleet was moved out of supplementary funding and into the core budget. It's now official that robot planes are here to stay, rather than being a temporary measure as some pilots might have hoped. Meanwhile the CIA - the original user of armed Predators - is mounting a serious, nominally-secret bombing campaign in the Pakistani borderlands using its drone fleet.